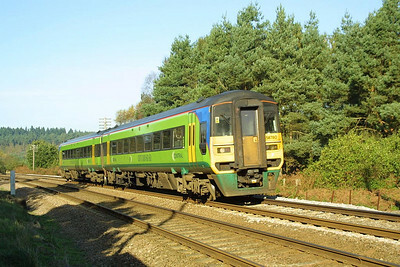 158780 works a Liverpool Lime Street-Norwich service through Thetford Forest at Santon Downham on 03/11/2001. 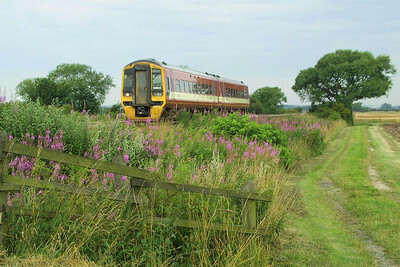 158905 heads east at Elsham Carrs on 26/07/2002. 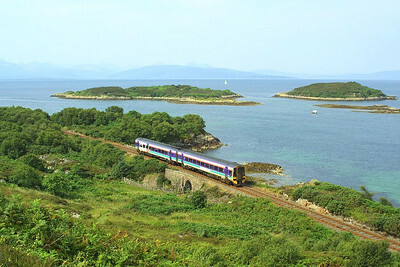 An unidentified Class 158 unit passes the picturesque location of Erbusaig shortly after departing from Kyle of Lochalsh with an Inverness service on 01/08/2002. 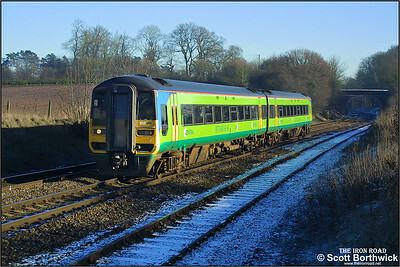 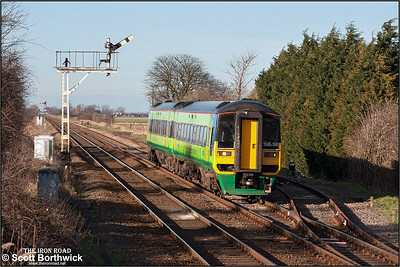 158791 approaches Whitacre Junction with a service for Birmingham New Street on 05/01/2003. 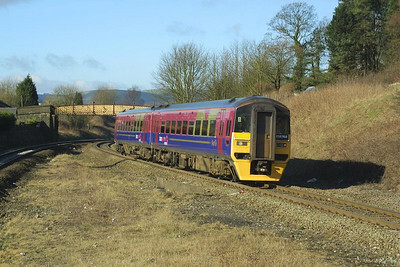 158742 works a Manchester Airport bound service at Hagg Lane Crossing, Gascoigne Wood on 17/04/2003. 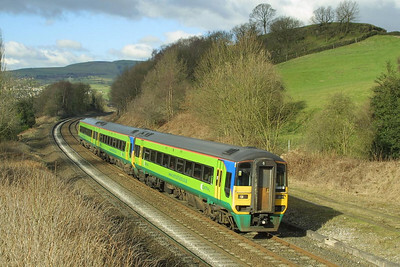 158768 sports an interim livery with the application of First Trans Penine vinyls as it passes Chinley on 23/03/2004 whilst forming 1B68 0839 Manchester Airport-Cleethorpes. 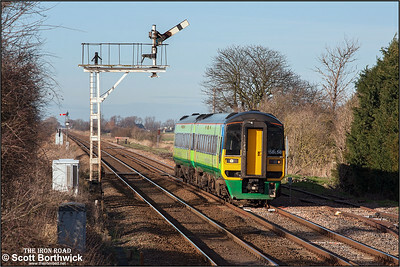 158953 passes Leaden Knowle, Chinley on 23/03/2004 whilst working 1L11 0749 Liverpool Lime Street-Norwich. 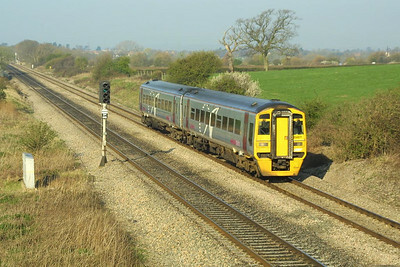 158871 is seen at Badgeworth working 2G04 0836 Gloucester-Worcester Shrub Hill on Good Friday, 09/04/2004. 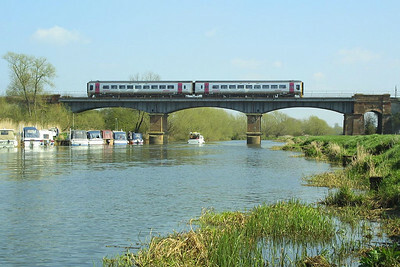 158749 is pictured crossing the River Avon at Eckington Bridge whilst working 2G17 1236 Worcester Shrub Hill-Bristol Temple Meads on 09/04/2004. 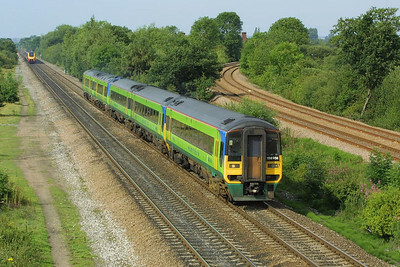 158958+170518 form 1M54 0743 Gloucester-Nottingham as it passes North Stafford Jnct on 24/07/2004. 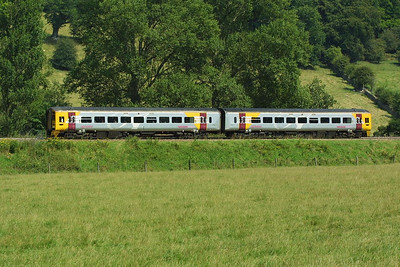 158745 forms 1F18 1224 Portsmouth Harbour-Cardiff Central near Bathampton on 31/07/2004. 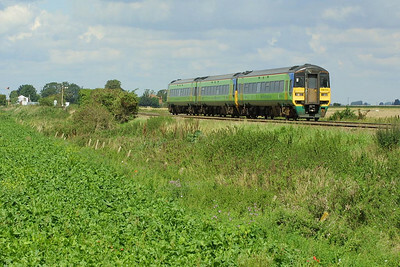 158860 approaches March at Westry on 21/08/2004 with 1L08 0827 Birmingham New Street-Stansted Airport. 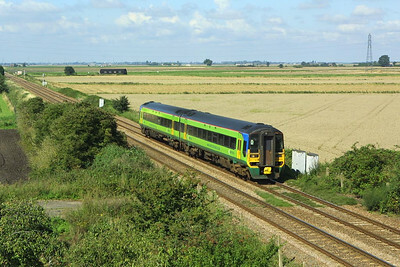 158954 crosses Cow Common and approaches Welney Road LC, Manea whilst forming 1L10 0927 Birmingham New Street-Stansted Airport on 21/08/2004. 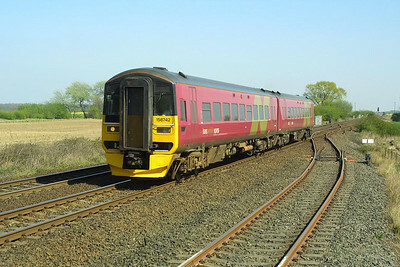 158774 works 1C78 0626 Manchester Airport-Middlesbrough at Bolton Percy in the early morning sunshine of 09/10/2004. 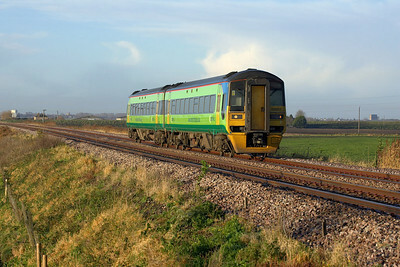 158856 works a Stansted Airport service at Manea on 23/01/2005. 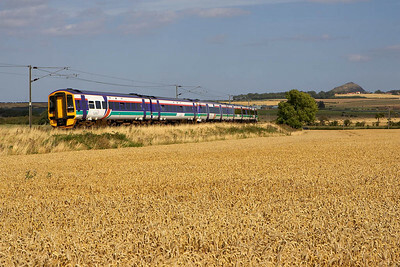 158709 brings up the rear of 2Y02 1234 Edinburgh Waverley-North Berwick at Drem on 30/08/2005. 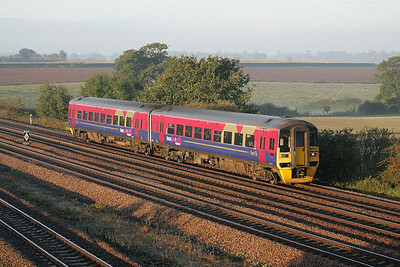 The service was lead by 170411. 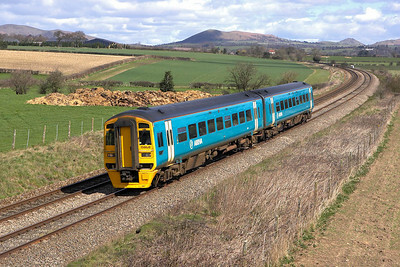 158838 forms 1V59 1235 Holyhead-Cardiff Central at Woofferton on 12/04/2006. 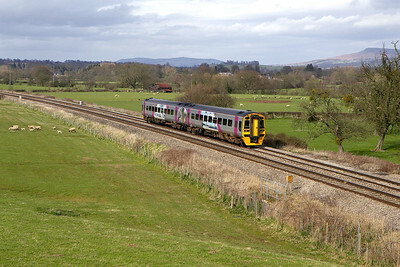 158860 approaches Woofferton on 12/04/2006 whilst forming 1V87 1456 Manchester Oxford Road-Carmarthen. 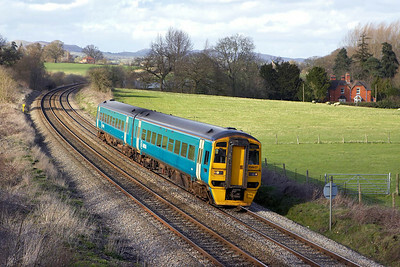 158853 approaches Woofferton on 13/04/2006 whilst forming 1V87 1456 Manchester Oxford Road-Carmarthen. 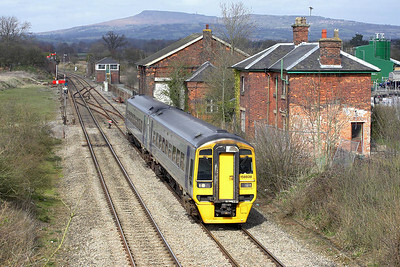 158837 approaches Craven Arms on 13/04/2006 with 1V61 1435 Holyhead-Cardiff Central. 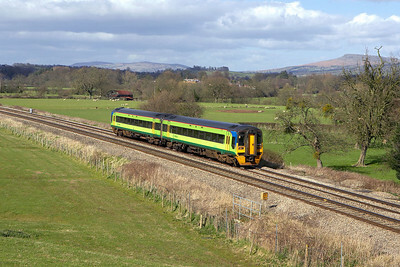 158828 passes Wistanstow on 14/04/2006 with 1V55 0815 Holyhead-Cardiff Central. 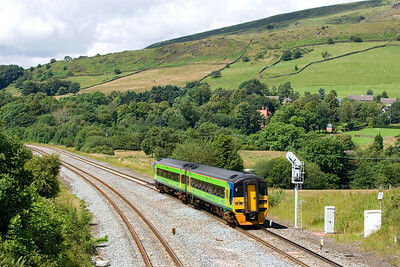 158788 passes Chinley whilst forming 1L17 1052 Liverpool Lime Street-Norwich on 28/07/2007.